So you’ve just put together a killer website and blog. Now you’re getting ready to make it known to the world. What’s next? Well, it just so happens that it’s exactly where I am now after creating the Earth Grounding Health website and blog. First, let me share with you what I’ve done so far. Researched a niche that interested me and that had promise for those interested in improving their health and that had affiliate positions available. The earthing/grounding niche is a very narrow niche targeting a specific audience. These are people who already do whatever they can to improve their health by following good nutritional guidelines, maintaining a regular exercise program and always open to discovering new ways to improve their current health. It is a growing field and on the cusp of getting bigger through information sharing. I will be one of those sharing that information and getting in position to profit over time. Next, I needed to build a website that stood up to the current needs of our technical world. What I mean by that is with the spread of cell phone technology, I wanted to make sure that I would not miss the lucrative market of cell phone users. This meant creating a website built using responsive design, HTML5 and CSS. It’s true that WordPress blogs offer responsive templates, but they do not offer the ability to apply search engine optimization the way it really needs to be done. Many marketers think that a blog is a website. They are not the same. A blog is a constantly growing entity while a website, although it can also grow, usually has a set amount of information that is static in nature. 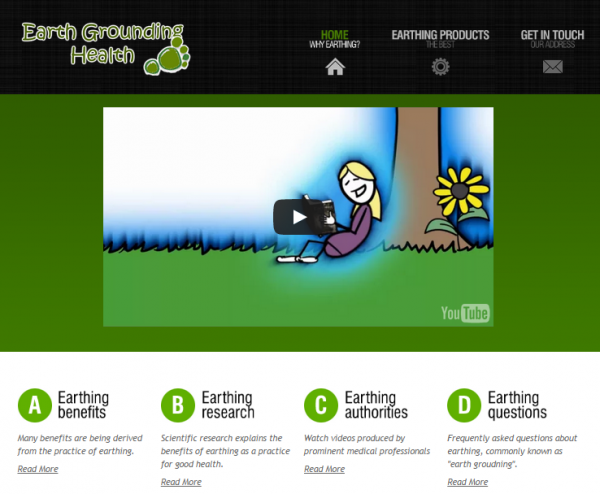 Creating a website like the Earth Grounding Health site I just finished, took about two weeks. The blog which is attached to the site is the medium used to promote the site through informative posts that will attract exactly the audience I wish to reach. Now the website is ready to be indexed by Google and other search engines. Many say that this next step is really not necessary and that the Google bots will find the site but for the little amount of time it takes me to submit my site to the Google, Bing and Ask bots, why not take that step. One submission is all you need. I also recommend you check your Alexa ranking so that you can see the progress. Interestingly, being only two weeks old, my Earth Grounding Health site already is registering a 2,471,454 ranking in the world and is 31,303 in Canada. I know of websites that were built years ago which Alexa has still to recognize and mine is only 14 days old. Why did my site get Alexa’s attention so early? Well, that all has to do with the internal search engine optimization techniques used. Now that my website has been indexed and is officially ready and open for business, I will proceed to work the blog by posting a minimum of 3 blog posts per week and using my backlink strategies to create more inbound traffic. During the next few weeks, I will report each week to show you the progress achieved by following this simple process. You will also be the first to know when it starts to monetize. If you want a niche site that has all the essential elements in place, be sure to contact me or visit my MarieLeonardOnline mentoring page for help.